Through education, improving information accessibility and recruiting new suppliers, Alex Marchyshyn helped Verizon improve sustainability standards throughout its supply chain. Verizon, one of the world’s largest telecommunication companies, has a diverse and global supply chain and a robust supplier code of conduct. To foster commitment to sustainability throughout its supply chain, Verizon has set a public commitment to have 75% of assessed suppliers be compliant with minimum CSR standards by 2020. EDF Climate Corps fellow Alex Marchyshyn was enlisted to assess the program and help the company meet their goals. In order to move Verizon closer to its target, Marchyshyn analyzed the current state of the program and identified opportunities to accelerate progress. The opportunities were primarily in the areas of program education and identification of additional, key suppliers to join the platform. There was an opportunity for both internal Verizon buyers and Verizon suppliers to understand the importance of the program and why CSR standards benefit both Verizon and Verizon suppliers. Marchyshyn educated both groups through multiple webinars. 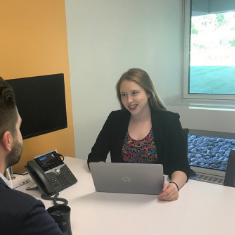 Over the course of the summer, she engaged with 20% of the assessed suppliers through 1-on-1 conversations and created customized, corrective action plans for underperformers. She also proposed and implemented a general email address that limits confusion and ensures that both suppliers and buyers always have the correct contact on the sustainability team. To further strengthen the portfolio of suppliers, Marchyshyn conducted an analysis of new suppliers, ultimately recommending a group that has the potential to increase participation by 15%. In ten weeks, Marchyshyn accelerated progress towards Verizon’s public goal by 5%, placing Verizon extremely close to hitting its goal two years early. Alex Marchyshyn is a dual MBA and Master of Environmental Management candidate at Duke University focusing on the intersection of business, the environment and supply chain. Before returning to school, she was a part of Environmental Defense Fund’s EDF+Business team and Edelman's Business + Social Purpose Practice.